You can buy the book on the publisher's website! 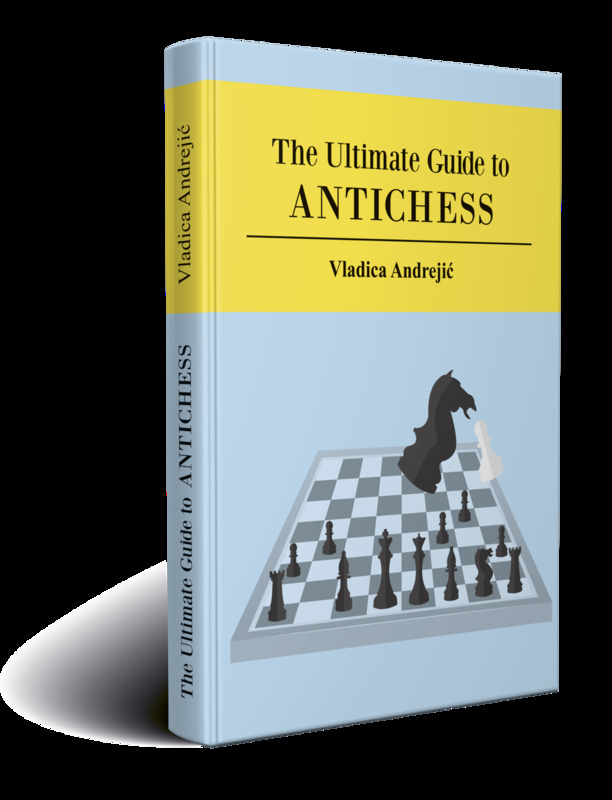 Antichess (Losing Chess, Giveaway Chess), in which capturing is compulsory and you try to give away all your men, has been a favourite chess relaxation ever since its first recorded appearance in 1876. Most of us play it solely for fun, a purpose to which it is admirably suited, but it has also inspired theoretical research both by humans and by computers, and the endgame phase in particular yields positions of remarkable elegance and beauty. It has featured from time to time in articles in mainstream chess magazines, but full-length books have been rare. The first to appear was Giveaway chess: a complete analysis by Michael Muff, undated but on internal evidence written around 1993-94. I don't know if it was formally published, but copies were certainly printed for private circulation. Unfortunately he believed that 1 e3 b5 led to a win for Black, and he mistakenly thought he had proved this. Next was Fabrice Liardet, who posted an excellent all-round account in French on his web site www.pion.ch. Again, I don't think there has been a formal printed edition, but at the time of writing it is still there and I hope that some way will be found of preserving it. And there was a lovely little book Schlagabtausch im Räuberschach by Ralf Binnewirtz, published in 2000 and containing most of the endgame studies and problems produced up to that time. But there has been no comprehensive account in English, and Vladica Andrejić, although himself a Serb, has been to the trouble of writing one. Vladica is a strong player who has come to the fore in recent years, and he is admirably equipped for the job. His book covers all aspects of the game: history, middlegame tactics and strategy, the endgame (both positions which occur regularly as the final stages of play and further positions which explore the elegance and subtlety of the game), and above all the analysis of openings. I wish it well.